How much is Eric Carle Worth? Eric Carle net worth: Eric Carle is an American designer, illustrator, and writer of children's books who has a net worth of $60 million. 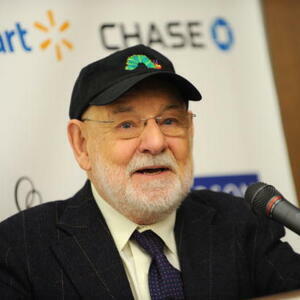 Eric Carle was born in Syracuse, New York in June 1928. He lived in Germany during World War II and was conscripted to dig trenches on the Siegfried line. Carle moved to New York City in 1952 with $40. He worked for The New York Times as a graphic designer in the promotion department. He served in the U.S. Army as a mail clerk during the Korean War. Carle later became director of an advertising agency. He was asked to collaborate on the picture book Brown Bear, Brown Bear, What Do You See? which became a best-seller. He started writing and illustrating his own stories and his first works included 1, 2, 3, to the Zoo and The Very Hungry Caterpillar. The Very Hungry Caterpillar has been translated into over 58 languages and sold over 38 million copies. Carle has illustrated more than 70 books and sold over 125 million copies worldwide. IN 2003 he won the Laura Ingalls Wilder Award and in 2010 he was a nominee for the Hans Christian Andersen Award. Some of Carle's other popular books include The Grouchy Ladybug, All Around Us, All in a Day, and Little Cloud.